BMW doubled production output of wheelhouse reinforcements by producing the reinforcements complete in this 2500-ton tandem press, including in-die fastener insertion, at maximum press speed of 25 strokes/min. This is a success story of the value of partnership and technology occurring at the BMW main stamping facility in Dingolfing, Germany. The technology employed is in-die fastening; the value is in the elimination of secondary operations. Two S-F units (similar to that shown here) are located on the press bolster, one on each side of the insertion die. The S-F equipment connects through a data bus line so they can communicate with each other and the press control. The connection with the press control initiates automatically at press startup. Specifically, it hoped to double production output by producing the reinforcements complete in a 2500-ton tandem press at maximum press speed of 25 strokes/min. Additionally, the specification stated that downtime due to the integration of the fastener-joining technology should be “negligible,” and not require press modification. The die was to be reconfigured for two-out production, designed to deliver—in the die—the 16 rivet nuts simultaneously to the parts. 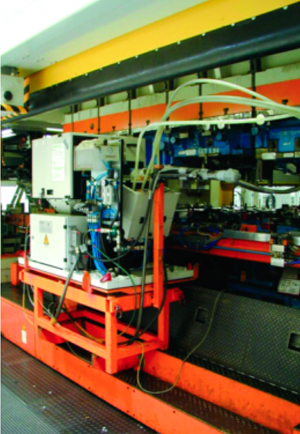 One of the fundamental challenges of integrating fastener insertion into the stamping process was locating the sorting and feeding (S-F) equipment on the press bolster, to minimize die-change time. Also, fastener insertion required an additional die station—the last station. Tackling the project, a tool layout was first created to determine the space available for the S-F equipment in the insertion station with the insertion die. Then the electrical and pneumatic scheme was planned, including the infrastructure needed to foster communication between the in-die tooling (piercing heads), S-F equipment and press control. Key was ensuring that the press only receives an enable signal when the nuts are correctly positioned in the pierce heads, achieved by locating sensors in the pierce heads and die. Mechanically mounted threaded fasteners in automotive sheetmetal applications typically fall into three categories: self pierce and rivet, rivet forming, and pressed insert. Self-piercing fasteners incorporate a cutting edge that, together with the insertion tool’s bottom die, pierce a hole for the fastener to be located and riveted in position. Rivet-type nuts and studs are inserted into preformed holes and have their shanks formed into a rivet head by the lower tool. Insert-type fasteners do not deform during installation, but rely on the base material flowing into undercuts and recesses in the fastener to achieve the required location and retention. Thread sizes range from M6 to M14. 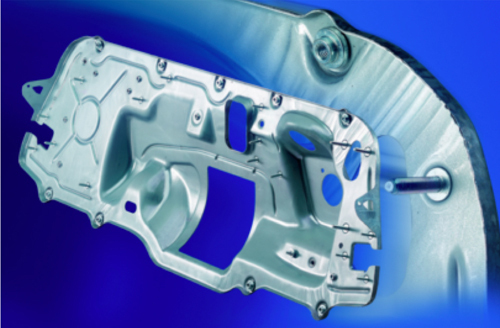 At the lower end of this spread, applications in the automotive sector include non-structural brackets to retain trim pieces. M10 fasteners find use in medium-duty applications, while M12 parts are used in suspension and subframe assemblies. Performance criteria include vibration and fatigue resistance. Here, welded fasteners can suffer significant failures due to thermal disruption of the sheetmetal structure, corrosion and from weld-heat damage to coated or plated surfaces. By contrast, mechanically attached nuts and studs prove ideal for use with corrosion-resistant finishes and materials such as the galvanized steel. Standard mechanical fasteners are available in grade 8.8 steel studs and 8 steel nuts, a full strength-grade higher than welded equivalents. In addition, they can be heattreated to grade 10.9 (or 12.9 in the case of studs), and 10 or 12 for nuts. An extensive range of mechanically attached aluminum nuts and studs also is available. Finally, in-die fasteners are making their into stampings of advanced high-strength steels. Examples include the insertion of class 10 RND nuts in Land-Rover Freelander 2 ‘A’ posts, which are produced from 600-MPa steel; class 12.9 studs in 850-MPa seat rails and seatbelt anchorage points in the company’s Freelander 2 and latest Discovery models; and Class 10 M8 RND nuts are inserted in 1200-MPa-steel side-impact beams used by Mercedes. In the specified solution, the nuts were required to feed from two sides. Accordingly, two S-F units are located on the bolster, one on each side of the insertion die. Each unit provides the required air and electrical connectors. Also, the S-F equipment connects through a data bus line so they can communicate with each other and the press control. The connection with the press control initiates automatically at press startup. With the support of stamping-sequence simulation software, the customer viewed how the die-protection system would function, ensuring that nuts would only feed when sensors signaled the presence of a stamped panel in the correct position in the insertion station. Also, no parts can leave the press without nuts properly inserted. Through sensors in the pierce heads, only after nuts are positioned and inserted correctly is the press-enable communication signal sent. The system ensures the avoidance of scrap and tool breakage. With little space available around the press, the S-F equipment had to be customized based on standardized modules. The magazine for the nuts was integrated into the S-F equipment and sized to supply enough nuts for a full production run. Also, since the press housing prohibits the use of an overhead crane for positioning the S-F equipment on the press bolster, a mobile baseframe scissor table gets the call. The S-F units are positioned and secured with a chain and rolling crank on the bolster. Then the units are connected to electrical and air supply lines and the feed tubes manually filled with nuts. When the pierce heads give the signal that a nut is correctly positioned in the head, the preliminary setup is complete. After the units are prepared, the bolster drives into the press. With the bolster in position, the S-F controller signals the press control indicating that the device can be switched from manual to automatic mode. The pierce heads remain closed while a nut feeds into position, but is not released—to avoid a false feed. With the help of sensors in the die and the grippers, the S-F control monitors the in-feed of the fasteners and, when the panel is placed in the die, opens the feeder channels. In four years of production, more than two million parts have been manufactured with the system described above. Press rate has doubled to 25 strokes/min., and the productivity targets prescribed have been fully realized. 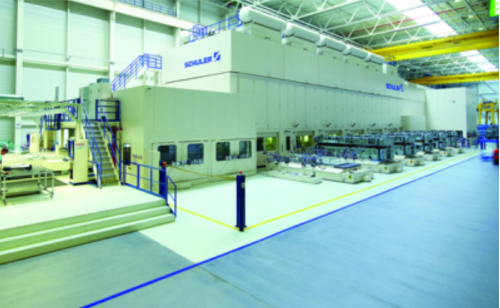 In fact, the system (provided by Profil System) has been standardized and now is used at five transfer-press lines operating at the OEM. In contrast to weld-on fasteners, the use of mechanical joining in the die allowed the customer to increase the value added in its stamping plant, and boost overall efficiency. Compared to thermal joining, in-die fastener technology is mechanically less expensive, requires no intermediate part transport, eliminates work in process and reduces quality costs. Comparative analyses show that mechanical joining can be 30 percent less expensive than conventional joining methods. In-die tolerances typically are half that of weld-on fasteners, and mechanical joining does not impair the stamped part’s microstructure, as might a weld-on fastener. Article submitted by Profil System Inc., Farmington Hills, MI: 248/860-2909; www.profil.eu. See also: Schuler Incorporated, Profil System Inc.